Nu Skin Rich Conditioner is a conditioner that is formulated with low pH levels to seal the hair cuticle for increased moisture retention and shine. It helps improve the look and feel of damaged hair for visibly younger, healthier looking hair in just seven days. It also repairs the outer shaft of the hair to restore youthful softness and smoothness. Shea butter mimics hair lipids and fills in cracks in the cuticles to increase hair length, and meadowfoam provides volume without weighing hair down, while holding moisture in the hair shaft and making hair seem fuller. Rich Conditioner is best for dry hair types, especially thick and coarse hair. U.K. Click Here! S.Africa Click Here! Other Countries Click Here! Enquiry Click Here! Seals the cuticle with a low pH formula for superior shine and increased moisture retention. Drenches the hair with lipids that mimic natural oils. Which shampoo should I use with Rich Conditioner? You can use Rich Conditioner with either of the daily Nu Skin Hair Care shampoos. 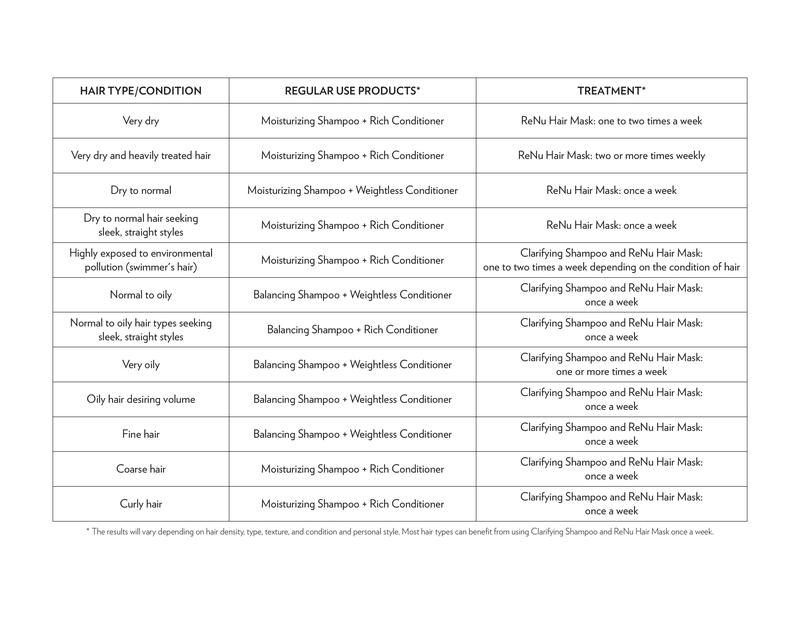 See the usage chart to see which shampoo and conditioner combination you should use for your hair type and the look you wish to achieve. Is Rich Conditioner safe for chemically treated hair? Rich Conditioner is nourishing and gentle enough for chemically treated hair. Rich Conditioner also assists in repairing the shaft and keeping the cuticle flat which helps prolong permanently colored hair. Shea Butter Mimics hair lipids and fills in cracks in the cuticles to increase hair strength. Meadowfoam – Provides volume without weighing down hair. Helps hold moisture in the hair shaft, which in turn makes the hair seem fuller. Moisturizing Shampoo: Best for dry hair types, especially thick and coarse hair. Balancing Shampoo: Best for normal to oily hair and people who shampoo daily. Rich Conditioner: Best for dry hair types, especially thick and coarse hair. Weightless Conditioner: Great for all hair types, especially fine or limp hair. Clarifying Shampoo: For all hair types. Use weekly to deep cleanse the hair and rid it of dulling buildup. Great for people with very oily hair. ReNu Hair Mask: Use weekly for all hair types. For drier and more damaged hair, use two to three times a week.